Today CLR-25 celebrated the 230th birthday of our beloved corps. The regiment gathered to hear the Commandant's birthday message. In keeping with tradition the oldest Marine had the first piece of cake, and then passed it to the youngest Marine. After the ceremony the regiment enjoyed a special meal. 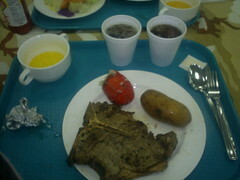 It was the best steak I have ever had in a war zone. 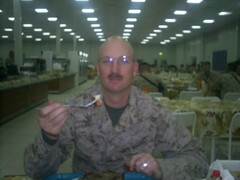 This is my first Marine Corps ball deployed. I am very happy to be where I am, surrounded by Marines living up to their name. The regiment is making a direct impact on the Global War on Terror and we will continue to do so. 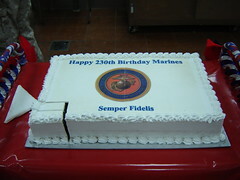 Happy Birthday and Semper Fidelis. Celebrating the Maine Corps Birthday in Iraq.